Whether you're on a budget or not, if you're looking for a darker, less aggressive crash, these are well worth checking out. Reasonable price point. Musical sound. Not for those who like their cymbals looking brand-new. These are dry, moderately complex and very musical cymbals. The cymbals feature the familiar Stagg logo, as well as a new art deco-style VB. Stagg is best known for making affordable gear of all shapes and sizes, but its cymbals have a reputation for punching above their weight. Designed to emulate the sounds of older, Turkish-style cymbals, the Vintage Bronze series has been well received since its introduction ﬁve years ago. On review are three new thin crashes that join existing Vintage Bronze medium crashes, rides, hi-hats and splashes. "The details are submerged beneath a raw patina that lends the cymbals an authentically aged appearance." Production of all Stagg cymbals takes place in China, and Vintage Bronze models are individually cast from tin-rich B20 bronze. The hammering has been worked by hand, leaving the crashes dotted with hammer marks. They have also been lightly lathed on top. These details are submerged beneath a raw patina that lends the cymbals an authentically aged appearance. No attempt has been made to clean or minimise the marks and scratches picked up during manufacture, so the cymbals look almost weather-beaten close up. They appear to have been gently buffed as well, as there is something of a warm glow to them. Under nothing stronger than room lighting, highlights chink brightly from out of the earthy hues. 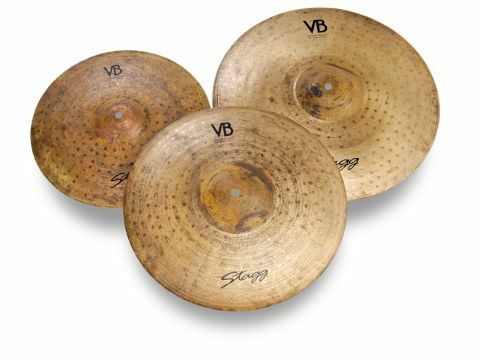 A black art deco-style VB logo is reproduced on each cymbal opposite the more familiar italicised Stagg script. In contrast to the tops, the undersides are neatly lathed and buffed to a golden shine. Stagg says that this is to make the cymbals thinner, but it would also inﬂ uence the performance by opening up the sound. The trio of cymbals is clearly intended for acoustic and quieter electric situations, a fact underlined by diameters that start at a small 14" and only go as far as 18". Tonally, they are quite dark, deﬁnitely warm and fairly trashy. The 14" model is the brightest of the three, possessing splash-like attack. The 16" and 18" are deeper-voiced and open to gentle notes. Top end is present, but the mid-range and lows are more abundant. As they swell to a full crash, the body of each cymbal asserts itself unhindered (rather than appearing from behind a blast of high frequencies). The subsequent decay is slow and harmonious. Overall they're dry, moderately complex and very musical cymbals that, in pure sound terms, compare favourably with premium brands. For the asking price they're a steal. While Stagg has earned its reputation for mass-producing budget instruments, these cymbals demonstrate that it is equally capable of turning out more serious gear. Vintage Bronze cymbals are clearly the products of creative cymbalsmiths and deserve to be judged alongside bigger names. The rustic looks and mellow tones here could easily command higher price tags but the Stagg logo and the commitment to value it represents keeps things thoroughly, if not absurdly, reasonable.